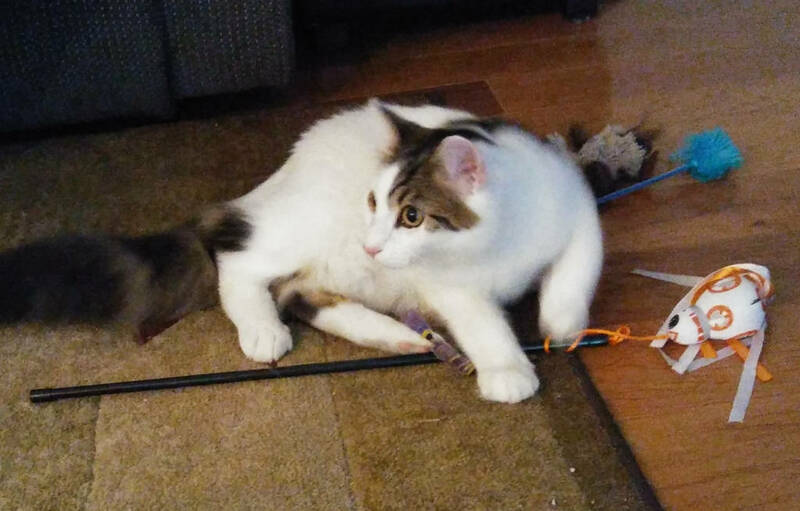 We had the pleasure of cat sitting Carter the kitten again this weekend but Carter is no longer a kitten. Well, he might still be a kitten but he sure has grown. Not only is Carter a friendly and affectionate cat, he is also quite funny. 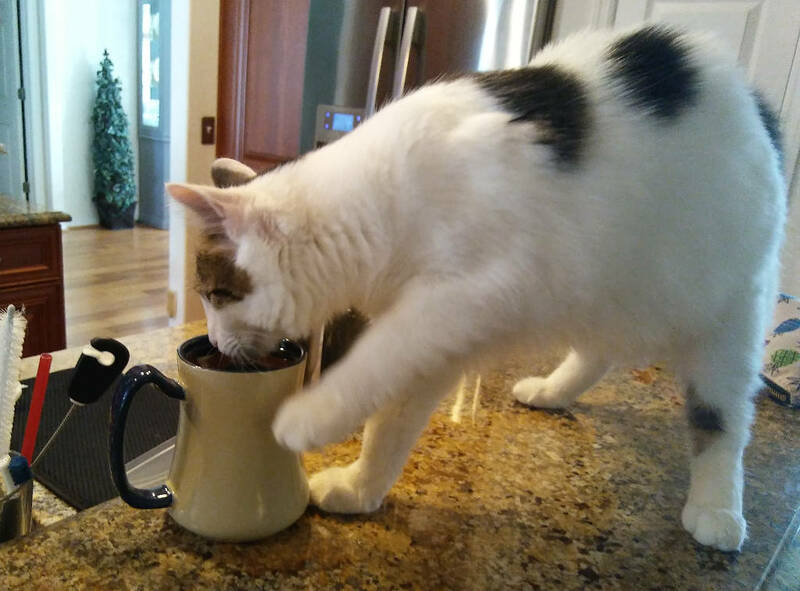 For one thing, he likes to drink out of human cups. He also likes to drink from the kitchen faucet. Chris used to drink from the faucet but he doesn’t do that anymore. Our cat Princess used to love drinking from the faucet. Who else has a cat that likes to drink out of the sink? This entry was posted in Uncategorized on October 11, 2017 by Charles Huss. I guess you are lucky it wasn’t cold coffee. Carter is a cutie pie! ❤ Did you almost adopt this guy???? No, our friends lost two cats and then adopted Carter. I think they need one more. Carter is a cutie. Our Phoebe loved to drink out of the sink until about a week before she passed. My husband even added a carpet on the edge so she wouldn’t slip. Carter is adorable. Cousin Trooper liked to drink from the sink. Thank you for the thoughtful and kind comment you made on our post about our Daddy. We know he’s an Angel smiling down on us but we are heartbroken. I’m sure he is smiling at you. that Carter is precious!! He was at your house? If so, I LOVE how he has made himself at home! We went to his house. I feel bad he has no brother or sister to keep him company. Carter is a cutie! 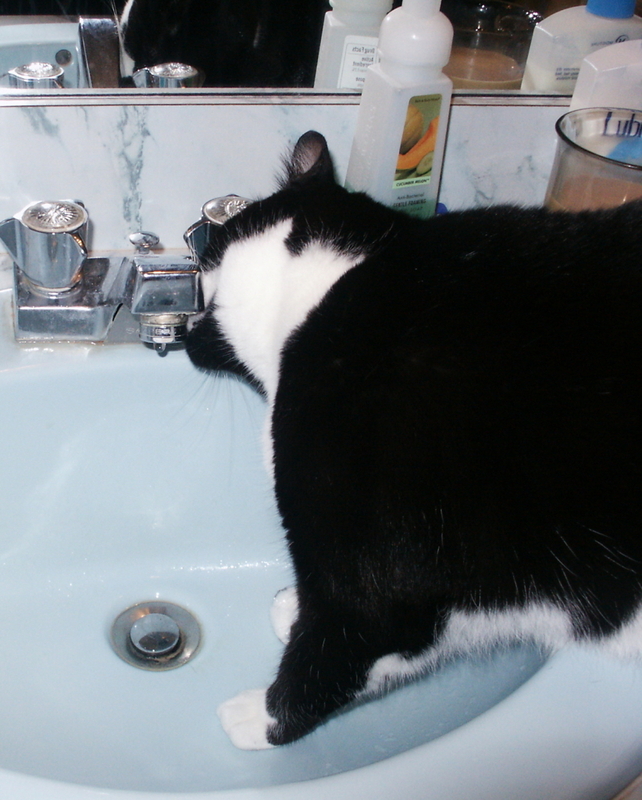 Binga likes drinking out of the faucet – she only adopted that habit as a senior. Chris did the opposite. He stopped drinking out of the sink. Carter is adorable……………..Teddy is a faucet drinker………I have to admit though we are tired of picking up all 17 lbs. of him to put him on the counter for a SLURP! Carter is a good looking cat. Ha, I didn’t think of that. my all white deaf cat Puti loves drinking out from the faucet.. even if i have 2 bowls of water for them she would patiently wait and get my attention for me to open the faucet.. i never saw her drinking from the bowl. I would think it would be natural, like drinking from a stream but we bought a $100 water fountain so my cat Puck would drink more… He never uses it. I think it is common, especially for kittens.